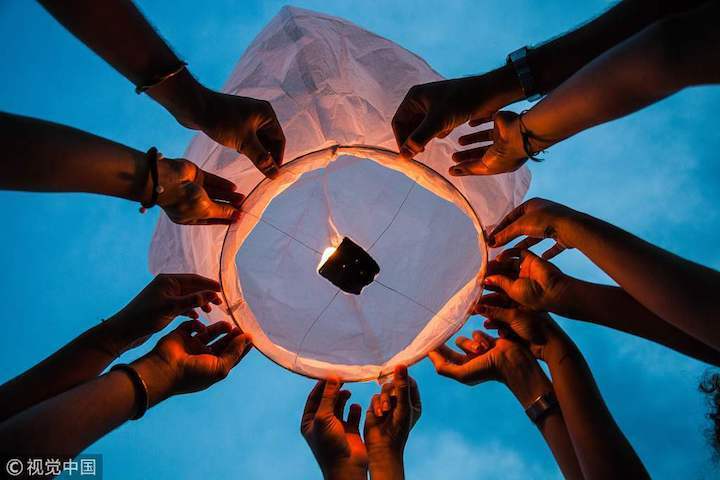 The pastime of flying lanterns goes back centuries in China, where they are symbols of peace and good fortune, but that tradition is now under attack. 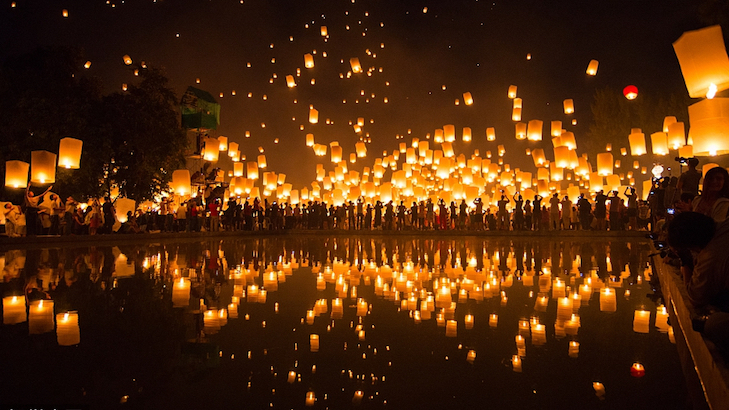 Traditional sky lanterns are made of paper and bamboo frames. After rising 300 to 500 meters, the flame suspended at the bottom goes out and the lantern falls. This makes them "flying garbage" and a "safety threat," say critics who want them abolished. Taiwan entrepreneur Shao Ai-Ting, 26, however, argues the lanterns can be made so they burn up in the air and no remains fall to the ground. 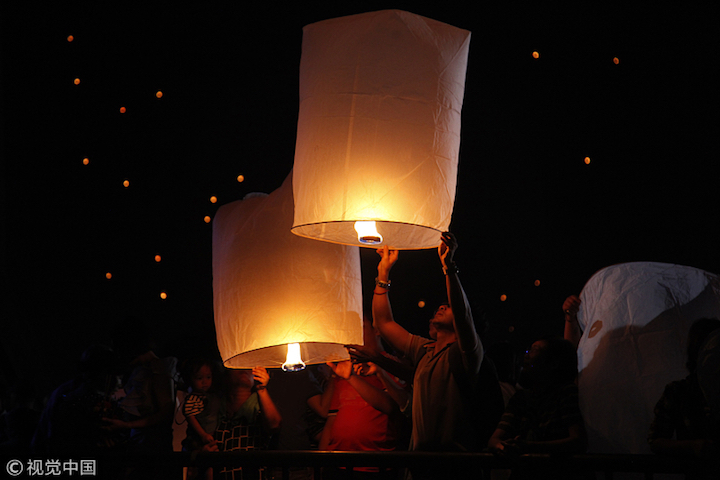 "The sky lantern is an important cultural attraction of Taiwan," said the woman entrepreneur. "If we just stand by and do nothing, they could really be banned. It would be a great pity, wouldn't it?" Also known as Kongming lanterns, they are believed to have been invented by renowned military strategist Zhuge Liang during the Three Kingdoms period (220-280) as a means to pass military information in war. In the Qing Dynasty (1644-1912), migrants from east China's Fujian Province brought them to Taiwan. Some settled in Pingxi, a hillside town in the north of the island. Threatened by bandits, they often fled to the mountains. Those left in the town would use lanterns to signal safety and call their families back. They were also called "safety lanterns" or "blessing lanterns." Sky lanterns are arguably a symbol of Taiwan. The Taiwan Pavilion at the 2010 Shanghai World Expo was built in the shape of a huge sky lantern and during holidays, the number of visitors to Pingxi would rise to 100,000. Pingxi's annual Lantern Festival in the Lunar New Year has been a spectacle with thousands of lanterns rising in the darkness. The next day, however, is another scene: fallen lanterns scattered on roofs, treetops, in streams and everywhere. They have become garbage. Most local dealers make lanterns with water-proof paper and adhesive tape or iron wire, but these materials cannot easily degrade in nature. It has been reported the iron frames have hurt or trapped wild animals. In some cases, lanterns caused fires or traffic accidents. "Don't let the lantern with your dreams become a nightmare for locals," says a petition calling for a ban by Pingxi villagers. "I really don't encourage releasing sky lanterns. I have seen a falling lantern kill an owl," said Youtube user "Afengxueping." 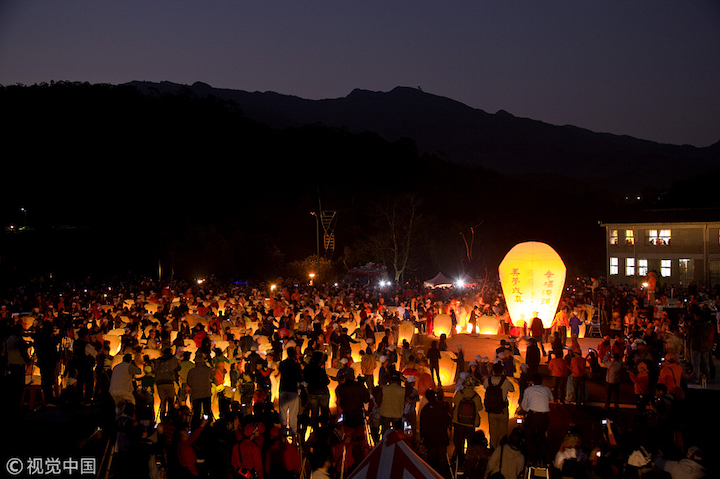 In the 2014 Lantern Festival, environmentalists criticized the mayors of three Taiwan cities for releasing sky lanterns together. Local authorities were required to re-evaluate the risks and tighten the controls. "Rather than the lantern itself, it is the garbage the lantern produces that should be banned," said Shao. In 2016, Shao founded a company called "Cultural Bank" to record, protect and innovate Taiwan's traditional culture. Since then, her team has begun to make lanterns more environmentally friendly. They once thought of making them with rice paper, so if they dropped in the mountains, the paper would dissolve in rain. 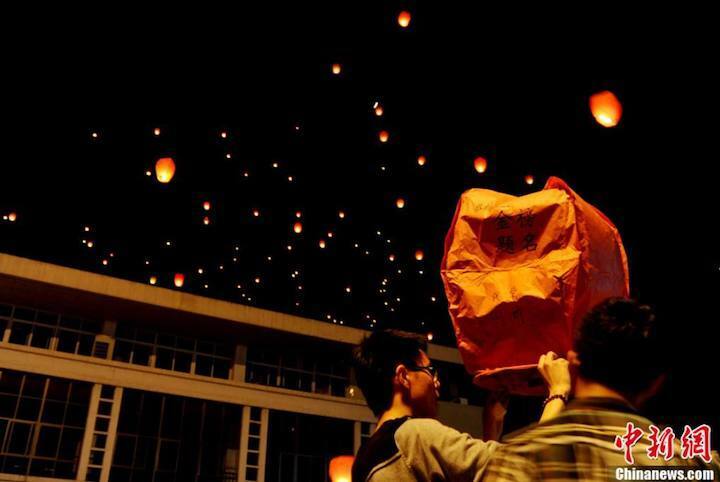 In February, Shao crowd-funded online for their latest lanterns and raised 1.6 million new Taiwan dollars (about 52,000 U.S. dollars) in about three months. They replaced the bamboo frame with a paper structure so the flame burns out the whole lantern in the air, "with nothing falling on the ground," said Shao. She planned to price an eco-friendly lantern at 350 to 450 new Taiwan dollars, two or three times the price of a common lantern. She had confidence that people would pay more for environment. However, some locals have cast doubt on her eco-friendly materials as too complex and likely to produce more pollution in the making process. Lin Guohe, 71, one of the few traditional lantern craftsmen in Pingxi, supported Shao, but proposed that lanterns should be friendly not only to the environment, but to the economy. Since 2013, the local government has offered cash rewards to people who bring lanterns to a recycling station. Most lantern collectors are elderly. If the eco-friendly lanterns become popular, they would lose that income, said Lin. Pingxi people once relied on coal mines, but after they were closed, the lantern business gradually became a pillar of the economy. "Without lanterns, who will come to this remote mountainous area?" asked one resident. One Facebook post suggested the lantern rubbish indicated Pingxi has been overrun by visitors. Shao said the lanterns could save the local economy. "If they are really banned for polluting the environment, the local economy will definitely be hit hard," she said. Many other traditional customs have already given way to environmental concerns. Mainland cities like Beijing and Shanghai have banned fireworks during the Spring Festival in light of heavy air pollution and injuries. In Taiwan, some firework shows at popular temple blessing ceremonies have also been canceled in recent years. On the other hand, many people like Shao are trying to keep traditional customs alive through innovation. Culture Art and Nature (CAN), a Taiwan company, made scraps of firework paper into red envelopes or blessing charms. Amber Chen, activity manager of CAN, said the idea of recycling firework paper explores new connections between believers and Matsu, the Chinese sea goddess. "Traditional beliefs and customs should not be prohibited due to environmental concerns. The two are not in contradiction, but could be balanced," said Chen. Shao is planning a green fund, using part of the revenue to plant trees, which may absorb the carbon emissions caused by burning lanterns. "Protecting culture is something that everyone can contribute to," she said.